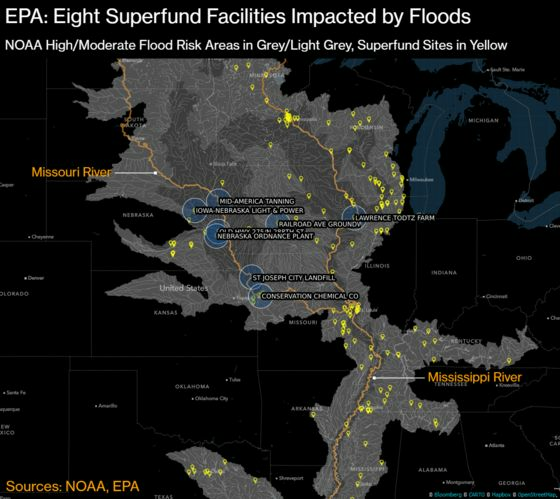 (Bloomberg) -- Major flooding across the U.S. Midwest has reached at least eight Superfund sites in three states, and kept EPA staff from determining whether any are leaking toxic chemicals as a result. Environmental advocates said that’s not good enough. Parts of the Nebraska Ordnance Plant, a 17,000-acre former munitions plant just west of Omaha, are “inaccessible,” Sauerhage said, citing information from the U.S. Army Corps of Engineers. The site’s treatment plant “was down for a few days,” but is now operating again, she said. At the Iowa-Nebraska Light & Power Co. site, in the small city of Norfolk, “fieldwork is delayed due to road closures,” Sauerhage said. Even before this month’s floods, the contaminated groundwater beneath the site was already moving toward Norfolk’s municipal well field half a mile away, according to information on the EPA’s website. The Railroad Avenue Groundwater Contamination Site, which is part of the West Des Moines water treatment plant, had “some standing water,” Sauerhage wrote. In the city of Camanche, just up the Mississippi from Davenport, a former landfill called Lawrence Todz Farm is “inaccessible due to road closure,” according to Sauerhage. Even before the floods, the EPA said there was “insufficient data” to know if the site’s contaminated groundwater, which includes arsenic, was under control. The Mid-America Tanning Company site, near Sergeant Bluff, contained more than 500 gallons of sulfuric acid when the facility stopped operating in 1989, according the EPA. The agency removed the site from its priority Superfund list in 2004, but said that maintenance and monitoring of the cleanup are ongoing. “Some portions of the site may be under water, but no major impacts anticipated,” Sauerhage said. In Kansas City, the Conservation Chemical Co. site, which stored and disposed chemicals from the 1960s to the 1980s, “is partially flooded,” according to Sauerhage. The EPA’s website says groundwater on the site contains cyanide and other dangerous compounds. At the St. Joseph City Landfill, just north of Kansas City, “fieldwork is delayed due to road closures,” Sauerhage said. Sauerhage said the agency is working with state and local officials to gather information about the sites. State environmental agencies in Nebraska, Iowa and Missouri didn’t immediately respond to requests for comment. The Federal Emergency Management Agency, asked for comment on how it’s protecting first responders and residents from possible chemical releases from the Superfund sites identified by the EPA, didn’t immediately respond.